Living in an island one naturally adopts a liking for seafood. The deep blue seas of Sri Lanka are blessed with an assortment of fish to suit any menu. Negombo is a name famous for its diverse seafood. We set off to discover the delights from the deep sea domain. As we entered the road leading to the fresh fish market, from the Negombo bus stand, sales were at their peak- with buyers and vendors trading comments about the fish. The vibrant fish auction has fascinated Sri Lankans for many years. It is a place where diverse age groups of fishermen gather from around 3 am to 11 am every day. The boats that leave in the evenings return early morning, and the multi day trawlers reach shore around 7 am. 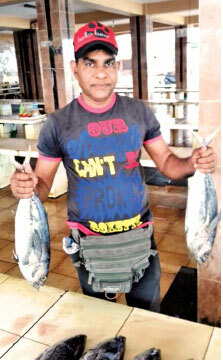 To these resilient seafarers fishing is a lifestyle. The sea is a challenging frontier laden with risk and a level of adventure. Most of these men start sailing in their youth and continue until old age, living on the edge. The fishing hamlet of Negombo is a predominantly Catholic area, now enriched with many hotels and restaurants. The busy fish market extends to both sides of the road. The left side (landside) has the small and medium fish sales, along with crabs and prawns. The vendors told us that there was excess fish today and thus prices were much less – a bonus for the housewives and restaurant owners. Some types of fish look strange and we wonder how they could be cooked. A vendor seeing my expression comments, “At times, we net in fish that are not common, and people are hesitant to buy. But, almost all the fish in the sea can be cooked and enjoyed”. The roof of the market is a haven for crows, as they hover about expectantly. Walking into the main fish auction, on the side adjacent to the pier is like walking into a seafood paradise. Lal who has been here for 17 years greets us and explains, ‘We rent out these stalls for 1,500 rupees a day, the prices of the fish vary, but we always manage to make a profit”. Some vendors and brokers (middlemen) are cautious salesmen with strong business acumen. Some grin, some stare and a few are on smart phones, some of them even using sophisticated gear. A multi-day trawler which had come alongside the small pier was readied to take what was offered by the fishermen. Out of the ship, four men jump into action and begin unloading sapparu and kenda fish. These fish weigh between 35 to 55 Kg and some are as long as a five to six feet. They are the relished fish that are sent overseas and fetch those top dollars. Presiding at the auction is a portly man in a black top hat and silver chain, in charge – the unofficial boss. In a calm but commanding voice, he controls the bargaining process and obviously respected by the other fishermen. Along the pier the trawlers have the names of prominent Christian saints – as the fishing crews place their journey into the hands of divine protection. We talked to the crew of a trawler, who had been out at sea for almost 25 days. They inform us that they load the boat with 8,000 litres of fuel. Provisions are taken for cooking, including fresh drinking water. Once at sea the men take turns, cooking. Life on board is routine, except for the weather which changes, unpredictably. Nowadays, the crew has the advantage of mobile phones to update their families. On an average, the voyage costs Rs 10-12lakhs, and the profit yielded at times is almost rupees 20 lakhs. Yet, there are some months when the target is not achieved and the boat owner is disappointed. The trawler’s crew don’t invest in life saving equipment and many have no form of insurance. It is day to day survival. Often, when they encounter danger at sea they are rescued by Navy boats on deep sea patrol. Iranganie, a jolly looking woman selling crabs, points out that the kadol kakuluwa (lagoon crab) must be cooked while it is alive to get the best taste. She reminds me to add ‘murunga leaves’ to enhance the flavour of the curry. This would prove a challenge for some women in the city- who would not know the art of cleaning a live crab! Every region of our island has its own cooking traditions. A few weeks ago in Jaffna we were able to have a cuttlefish curry where the ink-like substance was also induced to enrich the taste. Another section of the market has cutting boards. About a dozen men stand, inviting people to come and get their purchases cut to requirement. Their filleting skills have speed and accuracy. One vendor has collected the fish roe (eggs). In foreign countries fish roe is an expensive delicacy- especially, in Russia, where you pay top dollars for their caviar. Yet, in Sri Lanka the art of cooking and appreciating roe is not refined. People don’t include this in their menu. As we leave the market walking along a small bridge we notice some old anglers standing in quiet apprehension, along with some fat cats seated nearby with a greater degree of earnest anticipation. The aroma of steaming tea and lavaria (string hoppers filled with caramelized coconut) drifts from a small kiosk frequented by the fishermen. A few trawlers were coming into the pier. The fish market is operating at peak capacity today. It seems, all those present are satisfied. The fish auction at Negombo is unique. It displays the abundance of seafood in the country, and yet, as the vendors lament, we import containers of canned fish from other countries. It is true, the demand for seafood has increased. Yet, priority must be given to upgrade the local fishing industry and improve refrigeration and transport facilities. The fish auction is a celebration of Negombo life.